LAS VEGAS—“It’s been an interesting journey,” Pebble CEO Eric Migicovsky said as he stood on stage at his company’s first press event at CES 2013. The darling of Kickstarter raised more than $10 million from nearly 70,000 backers who wanted a stylish watch that connects with your smartphone, but now Migicovsky’s company has to ship the product he promised. Pebble announced Wednesday that the final product would begin to ship to backers over a six-to-eight-week period beginning January 23, a few months later than originally planned. The $150 watch (which can be preordered on Pebble’s website although it will be delivered after all the Kickstarter buyers get theirs) has a 1.26-inch-diagonal Sharp Memory LCD screen. The 144-pixel-by-168-pixel screen refreshes at 30 frames per second, so it features smooth animations and a responsive interface. The watch weighs in at a little more than one ounce and comes in five colors (black, white, red, gray, and orange). It even uses a standard 22-millimeter watch strap, so you can replace Pebble’s included polyurethane band with a fancier leather or metal one if you’re into that sort of thing. The Pebble is water resistant to 5 atmospheres, so you can wash the dishes or even take a shower while wearing it. But water-resistant means there aren’t any ports you can plug into, so to recharge, Pebble uses a small USB cable with a custom magnetic head that snaps on. 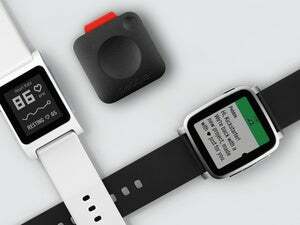 According to Migicovsky, Pebble’s designers have tried to make the most rock-solid hardware they could, and let their software play catch-up. So the watch has a bunch of cool features that aren’t yet enabled in software, including a magnetometer. There’s also an ambient light sensor, an accelerometer (a stiff tap on the watch face turns on the backlight temporarily), and a Bluetooth radio that currently uses Bluetooth 2.1 but is capable using the low-power Bluetooth 4.0 standard via a software update. Migicovsky promised that Pebble will release updates to the watch’s software every two to three weeks ‘until we’ve fulfilled every feature on our Kickstarter page.’ As an example, integration with the popular RunKeeper app is in the works, but won’t be ready for a month or two. As Migicovsky demonstrated Wednesday, Pebble can vibrate when you receive an email, text message, or other notification, and will display the contents of those messages on its screen. It’s also got a music controller that lets you play, pause, and advance through your music. It’s been quite a journey for Pebble from a cool idea to real product in mass production. When asked what he was most proud of about the Pebble, Migicovsky said he was happy that the final, fresh-from-the-factory Pebbles look very much like the product renderings they posted on Kickstarter. Pebble’s creators found that taking a product from dream to reality can be tricky, but the end of that journey is finally in sight.